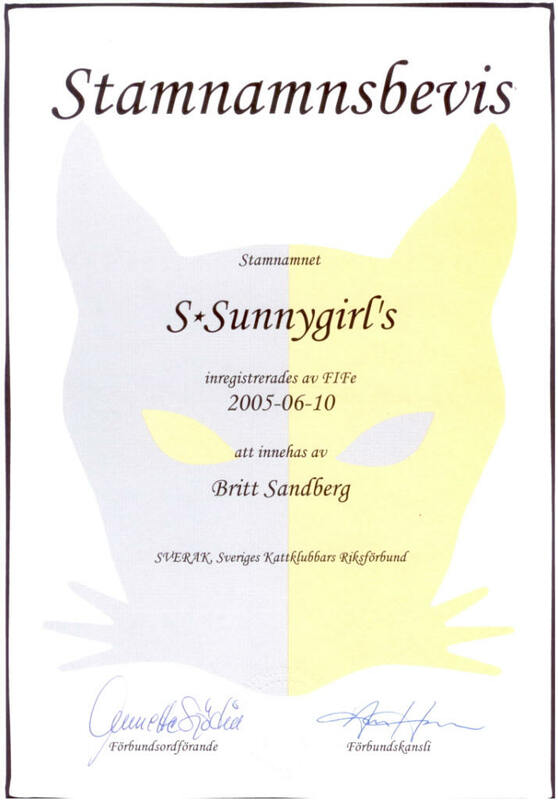 My name is Britt Sandberg and I am the owner of S*Sunnygirl's Cattery. The cats in S*Sunnygirl's cattery are mainly my friends and family. The cats can move freely around in my home and in the cat garden. The cats are full family members and participates in most of the things that I do when I am home. My cats and breeding of Norwegian Forest Cats is one of my hobbies. My ambition as a breeder is to in a small scale breed for healthy and social Norwegian Forest Cats. We live in a fairly large detached house in Hässelby Villastad, one of the suburbs of Stockholm. The house is located on a hillside so we have a good view of the surroundings. Over time the house has been more and more adjusted to suit also the cats. Among other things the cats now have a fairly large cat-garden located on our lower balcony. There they can feel the different seasons and weather conditions. As we have a cat-door in one of the windows the cats can freely go out and back in from the cat-garden. I don't want my cats to be outdoors uncontrolled as I had a very bad experience from my earlier housecat, Findus, who got deadly hurt by something outdoors. We also have a country house, located on the waterfront in Stockholm's archipelago in the Fågelbro area of Värmdö. We spend in average every other weekend there and we go there during all seasons. My father comes with us there most of the times, he is now over 90 years old. Also our country house have been adjusted to the cats. We have fenced in the patio so the cats can spend time outdoors. They enjoy to sit on the patio and look at the wildlife that passes and also the boats that pass on the waterfront. We are frequently passed by birds, squirrels, foxes, badgers, deers, .. .
My father, Gunnar, has also a house in Hässelby. The cats sometimes go there to visit with me. My mother, Karin, lives in a special home for people with memory problems as she now has a severe form of Alzheimer's disease. As my mother has always been very fond of animals and still finds it positive to meet with animals I frequently bring one or several cats with me when I go and visit her. It is always a big success when I bring cats both for the people living there and for the staff. In general my cats travel by car fairly frequently, they are not enthusiastic about the drive but they always enjoy to visit other places outside our home. To be a cat breeder has not been a since long planned activity but a rather quick development of my interest for animals. Most of my professional life I have spent travelling or living abroad for short or long periods. This kind of life does not go well together with having animals. Due to my mothers health problems I moved back to Sweden in late 1998 but still had a position that involved a lot of travel. As my parents needed more support and I thus needed to be home more I started my own business in early 2002 to be able to control my time better and not spend so much time travelling. Luckily this meant that as I no longer travelled a lot I now had the possibility to have pets, at least cats. Initially my neighbour's cat, Findus, moved in with me (they asked me to take care of her). She had been visiting frequently since the early 90ths so we knew each other well. In September 2004 she was badly hurt and there was no way to save her life. I missed her a lot but I soon decided to get new cat friends. This time I had decided to have my cats indoors. I wanted two cats in order for them to have company of each other when I was not home. Due to my business I spend most of the days and some long evenings away from home. To be able to grow well together I wanted my new friends as kittens. 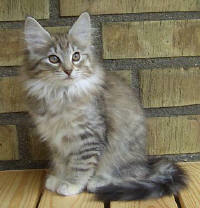 In my search for the best breed of cats for me I fell for the breed Norwegian Forest Cat. In my search for suitable cats I saw some photos of the litter from S*Ulabrands that were soon ready for delivery. I fell immediately in love with the photo of the quite Sunnygirl. This kitten made a deep impression in my heart and I really wanted to own her. She had a brother called Sunnyboy and he also looked very nice, but I had my mind set on two females as that would be easier to handle. I contacted Mona at S*Ulabrands but soon learned that Sunnygirl was already booked. I continued my search and as I have always been attracted to black cats I fell for the kittens at S*Sjöhorvan's where there was one black female kitten. The kittens from S*Sjöhorvan's were far from ready for delivery but I anyhow contacted Kattis at S*Sjöhorvan's. All of a sudden I get contacted by Mona from S*Ulabrands and now Sunnygirl has become available. I decided immediately that Sunnygirl and Sunnyboy would be my new friends. During the next weekend I drove to Helsingborg and back again to bring my new friends home, it was a big day for all of us. Both of them managed the long drive with me (a stranger to them) very well. This was in September 2004. Since then we have got to know each other very well, we have a wonderful relationship. Both Sunnygirl and Sunnyboy have developed very well but they are definitely two very different individuals. Read more about them on them on their individual pages. As I had started the dialogue with Kattis at S*Sjöhorvan's we decided to meet and look at their kittens without any commitments. Carmen was a wonderful black little kitten, just as I had dreamt of. Her sister Cajza was a real personality that was just charming. When I left I really had something to think about. I did have good experiences of having two cats from the same litter. This time the decision took longer but after Kattis also had visited us I finally decided that I also wanted Cajza and Carmen to be included in my cat family. To have 4 cats should not be much more difficult than having 2. It might actually be better for the cats as there were more possibilities for them to enjoy someone's company. 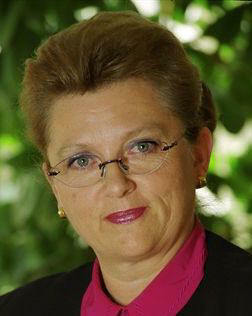 Kattis delivered Cajza and Carmen to us in November 2004. It worked out very well. All 4 cats are about the same age, only 2 months difference. They enjoy each other very much and are all great friends of mine. Each cat has its own personality. Read more about each of them on their own pages. I am very happy with my decision to get 4 cats quite rapidly. As they are so equal in age and all have a nice temperament they have grown together as a family very nicely. I have a fantastic cat-family living with me. Both breeders were interested in that I at least participated once in a cat-show to get some judgement on the cats. In December 2004 I participated in my first cat-show with all 4 kittens. This was Skogkattklubben Birka's show in Viksjö, fairly close to our home. It went better than we thought. Since then I and my cats have participated in many more shows. Often we have more than one cat participating. Of the initial 4 cats, that are now grown up cats, all of them have taken certificates and titles. To exhibit the cats at shows is not a necessity for me, we will only do that as long as the cats accepts it. During late spring 2005 I started to think about that I had an unique opportunity with two cat-ladies (Cajza and Carmen) and an unrelated male (Sunnyboy). Further studies of their background and other aspects lead to that they complemented each other very well. To prepare for eventual litters I started investigate what it took to be a registered breeder in SVERAK. I needed to find a name for my cattery. I thought that it could be a nice idea to name it after the Norwegian Forest Cat that I first fell in love with, Sunnygirl. The association of the name leads my mind to a happy and kind girl. I applied for the cattery name S*Sunnygirl's and it was granted to us in June 2005. In October 2005 Sunnyboy mated with Cajza and in December 2005 our first litter (A-litter) arrived, 4 wonderful kittens. 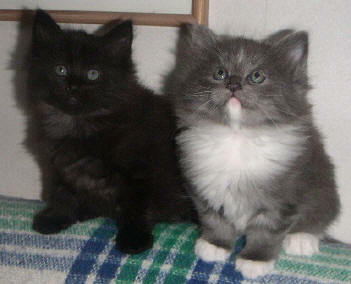 In December 2005 Sunnyboy mated with Carmen and in February our second litter (B-litter) arrived, 5 wonderful kittens. See the litters on their own pages >>. Now we had become cat-breeders. The development from a normal cat owner to a cat breeder with the house almost full of cats has gone fast, in just over a year. When my cats have had kittens I have had to keep some that have been special to me. But there is a limit on how many cats you can have, each one needs its dedicated time. Before we neuter Sunnyboy I want Cajza, Carmen and Sunnyboy to have a second chance to get kittens. It is also necessary for Sunnygirl to get kittens soon if she ever is going to have any. If we are lucky we can thus end up with 3 litters during a fairly short time. I order to prepare for this we have according to §16 in the Animal Protection Law applied for a permit to breed and sell three or more litters per year. 2006-10-16 it was granted to us by Stockholms Stads Miljö- och Hälsoskyddsnämnd. We have also permission to have more than 10 cats living with us. The permits are now valid until 2010-07-25.